with other magnifications also available. Stereo microscopes may even be equipped with zoom eyepieces. Compound microscopes operate so close to the maximum theoretically achievable resolution. Zoom eyepieces for compound microscopes are therefore practically non existent. They would simply reduce the image quality further without any gain of additional image information. The field number of the eyepiece indicates how much of the specimen is visible. Conventional eyepieces used in many laboratory and educational microscopes have a filed number of 18. at this value is often printed on the eyepiece itself. Wide-field eyepieces have field numbers of about 25, and provide a much richer visual experience. the field number does not have to do anything with the magnification, it is simply a measure on how much of the specimen can be seen at a time. The lower the field number, the smaller the circle displaying the specimen, and the more “tunnel-like” the appearance. When choosing appropriate eyepieces, it pays off to take eye-relief into consideration. How close to the eyepeices do you have to move your eyes in order to see a proper picture? The eye relief determines the viewing distance. Some eyepeices are designed to be used with eyeglasses and therefore have a large eye relief. The best results are obtained when the eyeglasses touch the front part of the eyepeice. Look for an eyeglasses symbol on the eyepiece to determine the eye releif. For eyepieces with a small eye relief, your eyes almost have to touch the front lens. Eyepieces with a large eye relief sometimes have an extensible front part. This extension tube does not contain any optical elements, and is simply there to help the microscopist to find the correct viewing distance. Microscopists which do not use eye glasses can then comfortably rest their eye brows on this extension tube. 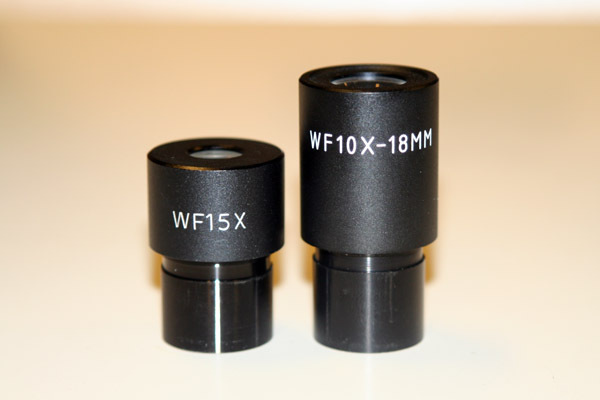 The left eyepiece magnifies 15x, the right one 10x. WF stands for “wide-field”. These eyepieces allow you to see more of the specimen and give a richer impression.